No, I am not losing my hearing. This is not about my hearing at all. But, often times, we talk about prayer as if we are talking to each other. We think our prayers are bouncing off the walls, that the words just bounce around in our heads, that they have no place to land. We understand that prayer is a conversation yet we have not accepted that God hears us, that God is all ears as it were. God understands every tongue, can translate our frustrations and interpret tears. God nods the divine head when we scream into a pillow or put our head in our hands. God even gets what we are saying when we don’t say a word. It’s true that the “Lord only knows.” We don’t have to say much or anything at all but we do have to speak up. No, I am not suggesting that God is deaf. Instead, I am asking that you and I direct our attention to God. With trembling bottom lip, heart racing, and a snotty nose, talk from that place and look up. Acknowledge the supreme power that is above you, less you sink into your despairing circumstances. Speak up and away from where you are. Remember that God looks out for you. Yes, God is with us but God is not stuck in our circumstances. God is present to walk us through. “This too shall pass.” Prayer will help us to talk it through. In fact, prayer gets us to the other side. With prayer, we regain perspective, get our bearings and find our footing. A bowed head agrees that God has a plan for us. Folded hands accept that life is not something we control. Bended knees trust that there is nowhere to go but to God in difficult times. Prayer is a reminder that God is accessible, that God is a not a celebrity deity who cannot be approached. Prayer is proof that you and I can get a hearing. Better still, God is not so busy ordering the world and managing its affairs that God does not have time to hear us out. So while we are trying to talk ourselves out of prayer, it is best that we listen up. Prayer is always an invitation to be accepted, a call to be answered, a conversation to jump into. God is always speaking and waiting for us to speak up. Reverend Starlette Thomas* is the interim pastor at Village Baptist Church in Bowie, Maryland and the Minister to Empower Congregations at the D.C. Baptist Convention. 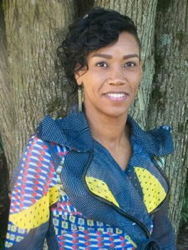 She writes on the social construct of race and the practice of faith at www.racelessgospel.com. Her hobbies include reading, writing, and Starbucks.